Shiva Rinpoche aka Chogtrul Shiva Lodrö Rinpoche and Jigme Pema Lodrö Gyatso (1966-2014) was a lineage holder of the Namkha Khyungdzong lineage, originating from Dudjom Lingpa and his student Degyal Rinpoche. He was recognized and enthroned by Dudjom Rinpoche as an incarnation of Golok Serta Rinpoche. Shiva Rinpoche was born on September 22th, 1966 in a Tibetan settlement of Orissa, India. His father was the Second Degyal Rinpoche, Pema Jigme Chöying Rangdröl and his mother Mayum Kyama Tsering. Before the birth, it said that “she dreamt that Golok Serta Rinpoche, dressed in white, gave to her a phurba and blessed her”. At birth, a rainbow was seen in the cloudless sky. When he was three years old, oral stories recount that Shiva Rinpoche “could precisely describe his previous life to two old disciples of Golok Serta Rinpoche, Tsultrim Gyatso and Pema Tashi”. Senior disciple of Golok Serta Rinpoche and of the Second Degyal Rinpoche — Lama Katak Rinpoche, Lama Tongnye, Lama Thupten Phuntsog Rinpoche, Pema Tashi and other — requested Dudjom Rinpoche to identify the reincarnation. On the 1st of January, in 1968, Dudjom Rinpoche recognized the young boy as the rebirth of Golok Serta Rinpoche and gave him the name of Jigme Pema Lodrö Gyatso. This happy event was celebrated in Nepal and India. Shiva Rinpoche’s root teachers were his father the Second Degyal Rinpoche, Thinley Norbu Rinpoche and Penor Rinpoche. From 5 years old, Shiva Rinpoche studied the tradition of Namkha Khyung Dzong with his father who was living in Humla valley, in Nepal. In particular, he followed the cursus of the Tröma Nakmo cycle of the Dudjom Tersar, from ngöndro to Dzogchen. When he was only 10 years old, he accomplished the traditional three years retreat, after which he began to guide practitioners. Until 1982, when he reached 16 years old, he assimilated studied the Namkha Khyung Dzong tradition, especially through the study and practice of the Zungdzin Trulpa Rangdröl, a tantra revealed by par the first Degyal Rinpoche. Then, he went on studying in India, entering the philosophical college of Namdröling, Penor Rinpoche’s monastery located in Mysore, where he was one of the best students. Shiva Rinpoche was chosen to be an assistant teacher and he assumed this responsibility throughout several years before going back to Nepal. 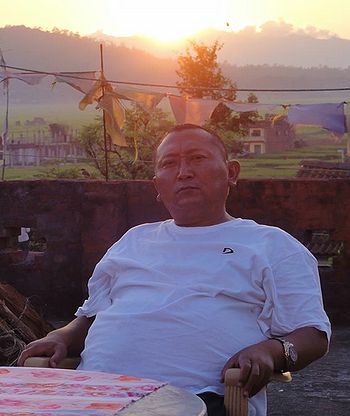 Shiva Rinpoche received teachings from Thinley Norbu Rinpoche, the eldest son of Dudjom Rinpoche, meditating under his guidance during four months, without any separation between day and night. During the later part of his life, Shiva Rinpoche lived in Nepal and spent much of his time in the mountain areas of the northern part of Nepal, doing retreats in very remote places. Shiva Rinpoche also ensured the preservation of the Namkha Khyung Dzong’s lineage of Dudjom Tersar by traveling all over the Himalayan region at the request of his disciples from Humla, Dolpo, Mugu and so on. In addition, Shiva Rinpoche has traveled to Taiwan, the United States and recently to France. On Sept. 4, Guru Rinpoche day, Shiva Rinpoche called his students to perform the Guru Tsok, then gave them extensive teachings and advice about their practice. Then he told them that this would be his last teaching to them as he was going to die. He told them that if they do good practice, they will die like this – with no pain or suffering, or any single belongings. He instructed them to leave his body for five days, then after that they could do whatever they like. With that, he took off all his clothes sat in meditation, then after two or three minutes, rainbow lights and spheres of light began to fill the room, and he entered into tukdam. The whole valley was filled with rainbows. Many people came from all over to witness this amazing event. His brothers, Tulku Pema Rigtsal, and Gyepa Rinpoche and Sangye Rinpoche arrived to begin the ceremonies. Dawa Chödak Rinpoche said that he fully expected his body to start shrinking. “This is how the Tröma Nakmo practitioners die,” he said when he heard the news. This page was last edited on 9 February 2019, at 07:57.